The Graduate Faculty consists of (a) appointed members: those members of the various colleges and schools of the University appointed by the President upon the recommendation of the Dean of the Graduate School; and (b) ex officio members: the President of the University; the Senior Vice President for Academic Affairs and Provost; the Vice President for Research and Associate Provost; the Vice President for Public Service and Outreach and Associate Provost; such other Vice Presidents as the President designates; the Dean of the Graduate School; the Director of Libraries, and the deans of colleges and schools authorized to offer programs leading to graduate degrees (cf. 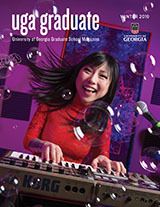 Statutes of the University of Georgia, Article VII, Section 1; https://provost.uga.edu/policies/statutes/article-vii-deans-of-schools-and-colleges/ ). Subject to the general policies of the University Council, the Graduate Faculty shall have authority to determine entrance requirements for students in the Graduate School, to prescribe and define courses of study for them, to determine the requirements for such degrees as are offered through the Graduate School, to enact and enforce rules for the guidance and government of its students in their graduate work, to recommend for degrees such candidates as have fulfilled degree requirements, and in general to exercise jurisdiction over all educational matters in the Graduate School (cf. Statutes of The University of Georgia, Article VIII, Section 1; https://provost.uga.edu/policies/statutes/article-viii-faculties-of-schools-and-colleges/ ). Researcher/Scholar Category. A Researcher/Scholar member of the Graduate Faculty is charged with the responsibility of serving as the major professor overseeing research/scholarship and training of Masters and Doctoral candidates, of maintaining an active research/scholarship program (as indicated by the publication of scholarly books, articles in refereed journals, refereed conference presentations, grants and contracts received, editorial work, creative activities appropriate to the various disciplines, and recognition of research and creative contributions by awards, prizes, and fellowships), of teaching advanced graduate courses as assigned by the department head, and of otherwise participating in the graduate program of the department and the university. Practitioner Category. A Practitioner member of the Graduate Faculty is charged with the responsibility of preparing Masters and Doctoral candidates for the practice of their profession, of supervising clinical training of students, interns, and/or residents, of maintaining an active presence in the profession (as indicated by such activities as licensure, consultation, clinical practice, field, laboratory, or performance experience), of teaching advanced graduate courses as assigned by the department head, and of otherwise participating in the graduate program of the department and the university. Each academic college and school will formulate its own procedures for review and evaluation of appointment and reappointment materials for full-time tenured and tenure track faculty members and those appointed as a professional, career, non-tenure track, or retired faculty to the Graduate Faculty. This review/evaluation is an integral part of the initial appointment, tenure, and post-tenure review processes. The procedure in each college and school must adhere to the definition of the Graduate Faculty (Policies and Procedures for Appointment of Graduate Faculty, Section II) and the qualifications for membership (Policies and Procedures for Appointment of Graduate Faculty, Section III) to ensure consistent standards of quality throughout the university. Each academic college and school forwards its appointments to the Dean of the Graduate School who recommends then to the President who then formally appoints the Graduate Faculty. Meetings of the Graduate Faculty may be called by the Dean of the Graduate School as they are The Dean shall call a meeting if requested to do so by a written petition signed by at least 5 percent of the total Graduate Faculty, including at least 5 percent of the Graduate Faculty in three or more colleges or schools; such a meeting shall be held within 30 days of the delivery of the petition to the Dean’s office. The Dean shall send notice of any meeting of the Graduate Faculty to all members of that Faculty at least two weeks before the The notice shall include an agenda of items to be acted upon, and no item not on the agenda may be acted upon unless two-thirds of the members attending the meeting agree to place the new item on the agenda for action. The Dean or a representative designated by the Dean presides at all meetings of the Graduate Faculty, but votes only to break a tie. A quorum for action at a Graduate Faculty meeting shall be a majority of the current membership of the Graduate Faculty.